The Advantage R model provides timing signals for funds that track small cap indexes based on timing signals from the Russell 2000 index. My current recommended low cost fund that tracks the Russell 2000 index is the iShares IWM ETF over the Vanguard funds due to the small size of assets in the Vanguard Russell 2000 index funds. Small cap indexes display greater seasonal tendencies than the large cap indexes as seen by the significantly greater differential in annualized returns of our strategy over buy & hold. 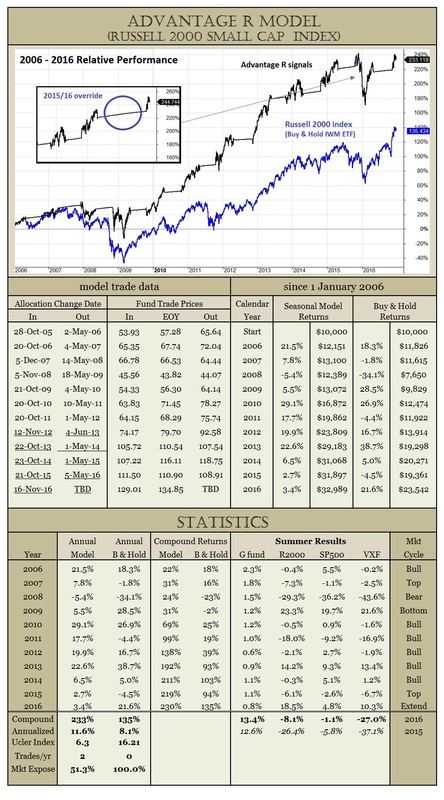 The results presented in the data are based on our objective seasonal timing model that uses the Russell 2000 index fund (IWM ETF) to generate optimized signals twice a year to enter and exit. In the chart, I added an insert to show the effect of my recommendation to sit out the 2015/2016 favorable season. We re-entered in the fall of 2016 based on the objective timing signals once again.